The region of Andalucía (Andalusia) is undoubtedly one of Spain’s most varied, enchanting and captivating and is often where first-time visitors to this special country decide to begin their travels. Many wonderful cities vie for your attention, but if we had a favorite then it would have to be one of the most spectacularly located cities in Spain – Ronda. The city sits on a massive rocky outcrop straddling the 100m deep El Tajo gorge amid the beautiful Serrania de Ronda mountain range. And although Ronda is just an hours’ drive away from the touristy Costa del Sol, it is a world away from the manic hustle and bustle further south. For this is a timeless city, a totally unique Andalusian jewel with ancient origins and one of the finest Moorish pueblo blancos (white villages) in the area. Cobbled alleys, beautiful churches, and dazzling whitewashed buildings are all waiting to be explored, not to mention some of the most charming cafes, tapas bars and restaurants in the whole of southern-Spain! Ronda is one of the oldest cities in Spain and remains of prehistoric settlements dating back to the Neolithic age have been found in the area surrounding what we today know as Ronda. Historians believe that the area was subsequently settled by Celtic tribes in the 6th BC. Known as Arunda, the settlement would later fall to the Phoenician settlers, who founded a small village known as Ronda La Vieja on the base of the El Tajo gorge. However, Ronda’s true history begins with the onset of the second Punic War between Rome and the Carthaginians of North Africa. Ronda was founded as a fortified settlement by the Roman General Scipio Africanus and was granted the title of city during the reign of Julius Caesar. After the collapse of the Western Roman Empire in the 5th century AD, Ronda was conquered by the Visigoth King Leovilgildo in the 6th century. The Visigoths ruled over the Iberian Peninsula for over a century and Toledo, in central Spain, became their capital. By 700, with famine in Toledo and chaos throughout the peninsula, the Visigoth Kingdom was falling apart. This paved the way for the Moors from North Africa to invade in 711, which set Spain’s destiny apart from the rest of Europe. The Moors ruled Spain for almost four centuries and named Ronda Izn-Rand Onda, meaning city of the castle. From 929-1031 the Caliphate of Cordoba ruled over Al-Andalus until it disintegrated following a devastating civil war. Thereafter Ronda became the capital of the small Berber Tarifa or province until the mid-11th century when the city came under Sevillan rule. Between the 13th and 15th centuries, the Moors gradually lost control of the Iberian Peninsula until the Granada Emirate or territory was the only Muslim state remaining. This fell to the Catholic Monarchs in 1492 and Ronda itself was re-taken by the Marquis of Cadiz in 1485. Hereafter a profound set of political, economic and cultural changes would sweep through Andalucía, as the Catholic Monarchs Fernando and Isabel sought to heavily suppress the remaining Muslims and Jews in Spain. 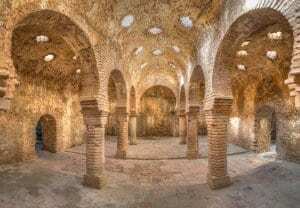 Ronda’s existing Islamic building were torn down and replaced or adapted to Christian religious requirements. Many Muslims and Jews fled Spain in the 15th and 16th centuries, those who wished to stay were forced to convert to Christianity and had their freedoms severely restricted. The revived Spanish inquisition tortured many innocent Muslims and Jews, accusing them of continuing to practice their religion in secret. This sparked several revolts across Andalucía, including a bloody siege in 1566. The catalyst was a decree from the Spanish King Philip II that prohibited the use of the Arabic language, heavily taxed Muslin trade and forced citizens to leave their homes open to inspection on Fridays, to ensure that no Muslim prayers were being conducted. Under the leadership of Al-Fihrey, a bloody battle ensured and the Muslims defeated the Spanish forces sent to suppress the rebellion. After the battle Philip ordered all Muslims in Ronda killed and only a few survived, to be sold into slavery. The remaining Muslims were finally expelled altogether from Spain by Felipe II between 1609 and 1614. More suffering would follow for the citizens of Ronda in the 17th century. Spain was preoccupied with a number of European wars in this period, neglecting more pressing domestic problems closer to home. In Andalucía, epidemics and bad harvests killed over 300,000 people. Cities like Ronda, following the expulsion of the Jews and Muslims, were becoming dangerously underpopulated. Things improved for Ronda’s population under the Bourbon dynasty in the 18th century and the so-called age of Enlightenment as the Monarchs made several key investments into the Andalusian economy and infrastructure. New settlers from other parts of Spain boosted the region’s population to over 1.7 million by 1787. Sadly, the 1800s would bring more strife and conflict for the people of Ronda. Its citizens suffered heavily during the Napoleonic invasion of Spain and the subsequent Peninsula War, which cost over 10,000 lives in the city. Ronda was the base for Spanish guerilla warriors fighting against French troops occupying Spain, who were finally driven out – with the help of British and Portuguese forces – in 1813. Ronda’s economy during this period stagnated and was largely based on agriculture. However, Ronda made a significant contribution to the art of bullfighting in this period. The grandson of the great bullfighter Francisco Romero, Pedro, perfected an intellectual, elegant and classic style, still known today as the Escuela Rondena, in which matadors or fighters work as one with the bull. In the 20th century Ronda was, like all cities in Andalucía affected by the Spanish Civil War. The conflict between General Franco’s forces and the Republicans claimed over 700,000 lives – the famous scene in Hemingway’s “For Whom the Bell Tolls” describing the execution of Fascists who are thrown off a cliff is believed to have been inspired by event that took place in Ronda. After his victory, some normality would return to Ronda, the city was unaffected by the Second World War as Franco refused to involve Spain in the conflict, however, Spain was excluded from the United Nations until 1955. After Franco’s death in 1975, rapid change swept across Andalucía as the newly elected democratic government instigated reforms in social and economic policy in Spain. A widespread air of prosperity rapidly spread in this enchanting part of Europe and Ronda benefited from the increases in tourism and prosperity. Today, the city continues to attract legions of visitors who marvel at Ronda’s unique location, breath-taking scenery and lively cultural scene. It offers a unique gateway into Spain’s Moorish past, whilst retaining a modern, dynamic air. The best time to discover it is outside of the summer months. 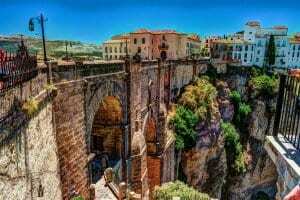 Welcome to Ronda, Andalucía’s finest small city! Andalusian cooking is typically Mediterranean in its heavy use of olive oil, garlic, onions, peppers, and tomatoes. Traditionally, it was simple peasant fare until the Arabs arrived and made a lasting impact on the cuisine of southern Spain. Rice, lemons, spices, oranges, mint, olives and vines were introduced and the Moors’ influence remains an important part of Andalucía’s cuisine today. 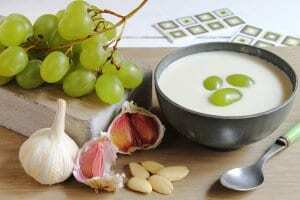 Ronda, which is located in the Malaga Mountains, is famous for its delicious game and stews, Ajo Blanco (cold garlic and almond soup) are another big specialty of the region. Trout, Rabbit, Partridge, and quail are all found in abundance. Wine lovers visiting Ronda are in for a treat, as Andalucía is the land of superlative fortified wines, the best of these is undoubtedly Jerez (Sherry). It comes in various guises, the most popular with tapas being the light and refreshing dry Fino style. The longer-aged, richer styles of Amontillado and Oloroso sherry go well with stronger tapas dishes, whilst the sweet Pedro Ximenez sherry can stand up to most desserts! Some fantastic still wines are also being produced by pioneering winemakers like Friedrich Schatz in the Sierras de Ronda region, who’s varietal Cabernet Sauvignon and Chardonnay wines are truly excellent. This beautiful church stands on the site of Ronda’s main mosque. Its tower reveals the building’s Islamic origins and just inside the church entrance is an arch covered with Arabic inscriptions. It is a fascinating mix of architectural styles, the church was begun in the Gothic style but, as the building went on over the centuries, tastes changed to the Renaissance style and finally Baroque in the northern end. Built for Abomelic, ruler of Ronda in the 14th century, the palace was altered soon after the Christian conquest and history records that the Monarchs Isabel and Fernando stayed here at some point. Highlights include the patio Mudejar, from which a horseshoe arch leads to a cliff top garden with stunning views. Some of the palace rooms also have a museum on prehistoric life in the Ronda area. A fascinating museum, dedicated to the banditry for which central Andalucía, including the Ronda area, was once renowned. Ronda’s old town is a living museum to the city’s Muslim past and a must-see for any visitor. Although most of the Muslim buildings have been modified over the centuries, it still retains the character of a typical old Muslim town. Enjoy wandering through the cobbled alleyways and marvel at the barrios, beautiful churches and whitewashed buildings. The sheer volume of cafes, restaurants, and bars in Ronda is enormous considering the city’s size, but your first port of call must be the delightful tapas bars in the city’s new part, known as “El Mercadillo”. Andalucía can lay claim to inventing the custom of offering Tapas to customers, legend states that bartenders would cover glasses with a saucer or tapa (lid) to keep out flies, the custom progressed to chunks of cheese, or a few olives, being placed on a platter to accompany a drink. Some of Ronda’s better restaurants are located away from the touristy Plaza de Espana area, try Doña Pepa for classic, hearty Ronda cuisine. This is the most refined restaurant in Ronda offering creative Andalusian dishes in a delightful townhouse from the 1800s. The decor is stylish and modern- plush surroundings to enjoy the elegant cuisine.